Like thousand of others, I stayed up for more than 6 hours for the Sundown Marathon. The only difference is that for the many thousand of runners, they were running from Changi to Fort Road and back while I was stucked in an almost ulu stretch of the ECP for 6 hours. Together with M, I had made a almost last minute decision to go down and support friends who were doing this race. We parked ourselves at 31km and waited for the runners to come by. Unlike the previous 2 years, it was a much smaller affair with only the 2 of us; since it was a last minute affair and I couldn't get helps at such last minute. We had a few bottles of coke, hot coffee, deep heat for the runners and sand flies and mosquitoes for us:). I also tried taking photos but the few test shots turned up horribly bad due to the darkness and so I gave up. Sorry guys, no pictures this time round! We had reached at around 11 pm and was just in time to see the 1st runner of the ultra marathon zipping by! That was the 30km which means he had completed 60km in 5 hours! Big big salute! We then walked towards the NSRCC as Team Pegasus support table was already at the 30km and I didn't see the point of being so near them as we shared many common friends and acquaintances. We whiled away the time lying there chitchatting (Good time to paktor!) as the gaps between the ultra marathoners was quite big. Slowly, one by one, the ultra marathoner came around, cruising past seemingly without any effort! There was this 1 guy who came passed and when we clapped for him, he showed us his red bib and told us not to laugh but he was a full marathoner but was giving up and had taken a shortcut to walk back! At 2 am, the full marathon runners started appearing, first a trickle, and then more and more of them. We recognised a few faces, cheered for them and for those who were willing to stop, gave them a drink. We missed many others simply I think because of the dark surrounding and they were too engrossed in the race to notice us. At around 4.30 in the morning, 4 and a half hour after the full marathon started, the runners had become walkers. Now I have nothing against plodders or people who walked during a marathon, but the sheer number of them made me wonder why these people bothered to stay up and take part in the first place. Don't get me wrong here. There is nothing wrong in walking part of the route and especially for the ultra marathoner but fact that so many of these young people were walking indicated that they had not even bothered to prepare for the race. At 5 in the morning, when we decided to pack up, the walkers were still coming non-stop. A rough back of the envelope calculation - these people took 5 hours to complete 30km which makes it 2.5 hours for every 15km at 10 mins per km and assuming they can sustain this pace, they will need another 2 hours to finish the full marathon. 7 hours to run a marathon? Fine if you are an auntie and uncle in the sixties or seventies but most of these walkers were young looking - in their early twenties. A lot of them were young couples walking hand in hand - just like going for a date. These people have devalued the worth of doing a marathon! I guess most of them have not even bother to train for it taking the whole race as just a fun event. Some probably just want the finisher t and the bragging rights that come with it! 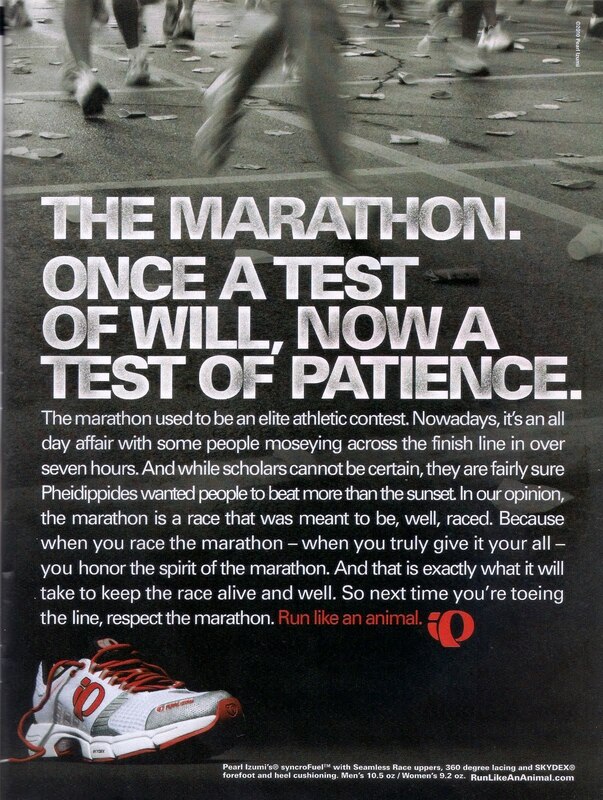 For many, the marathon used to be a test of will, determination and energy. It is about you challenging yourself over a distance and going about it by putting in the best effort. 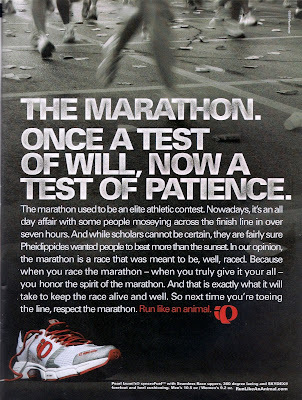 Like the Pearl Izumi ad above, now it is a test of patience, I guess for the organiser and other serious runners. For me, I lost my patience and went home. For those with the patience to walk 7 - 8 hours, I leave them with the above message from the people at Pearl Izumi and hopefully, the next time you guys put on a marathon finisher tee, you will have earned it! nice to see you & M on the course. Next time drive to NSRCC and park by the road side(not much traffic after midnight) and set up the shop there. Was looking forward to your entry on Sundown and again I wasn't disappointed. Nice entry, especially the respect for marathon. I did a 5:28hrs and was so surprised to find more than 75% of the finishers behind me. P.S. I think I saw you at ECP. Thanks for showing your support. Tigger, wasn't sure whether there will be road closure there so didn't go up. Can it be the dread ...?